Did you know that nutritious refreshments made from healthy snack recipes for kids may not only be a body and brain booster, but that it also may have a huge impact on your child's mood? Well, everyone is familiar with the saying "you are what you eat", yet I bet many, like myself, think this just refers to a person's body shape. 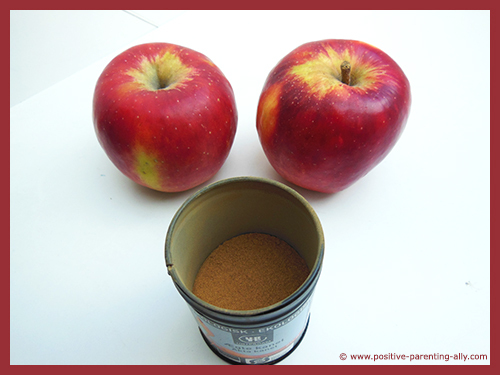 However, what you put in your mouth has just as much impact on how you feel, your mood. And this seems to be especially pronounced with children. Experts believe that certain healthy foods induce feelings of well-being and happiness in a child, while foods that are less nutritious are more likely to cause a poor mood. Also, children who are particularly sensitive to certain food preservatives and additives often seem to be affected the most. 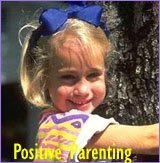 Furthermore, it is also thought that symptoms of ADHD and other behavioral disorders can be magnified when the child has a poor diet. So what are the foods and ingredients to avoid? Well, let's first take a look at the "Grumpy Food Groups". Sugar, unhealthy fats and salt are the main culprits when it comes to ingredients in food that are most likely to cause poor or bad moods in children. However, according to Dr. Sears, specific foods that cause low mood will vary from child to child, as some children are more sensitive to certain ingredients than others. Dr. Sears goes on to recommend that parents who wish to see an improvement in their child's mood should avoid making snacks for kids that involve chips, cookies and candy. It is also thought that most microwave meals, junk food, and soda are inductive to causing depressive symptoms in children. Bad mood foods usually contain something known as refined carbohydrates, which are known for releasing the particular stress hormones linked to mood disruption in both children and adults. So if you find your children to be moody for no apparent reason, it may pay off looking more closely into their diet. It may not have anything to do with their diet, but it could have. And then you can do something about it. 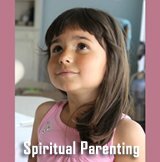 If your child is generally in good spirits and seems emotionally well-balanced, then there is a good chance they are receiving a nutritious diet. (Again, there may be so many different factors at play that it is difficult to isolate just one and say, this is the reason, but healthy foods may be a very good contributor to emotional balance). Certain complex carbohydrates, such as those found in whole grain pasta, whole grain bread, oatmeal and brown rice can help maintain your child's good mood as they help stabilize their blood sugar levels. Small snacks for kids that include chicken, bananas, leafy green vegetables and even dark chocolate all have a positive effect on a child's mood. This is because these foods release a brain chemical called dopamine, which induces feelings of contentment and happiness. Also, foods containing Omega-3 acid, selenium and folic acid are all known to help prevent feelings of depression. 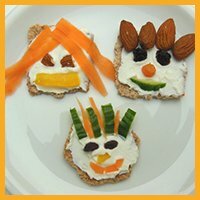 So, now that we know the importance of good mood foods, how about we get started playing around with some healthy snack recipes for kids. 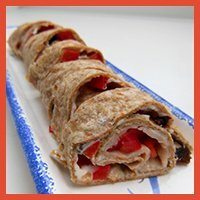 So with no further ado, here is a list of healthy snack recipes for kids that contain no sugar and that are (for the most part) made from scratch with only healthy vegetables, fruits and protein sources. 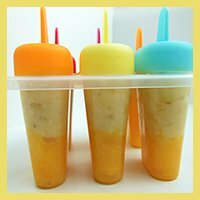 This quick kids snack is so simple and quick to do, and is ideal for toddlers as an after daycare finger food snack. 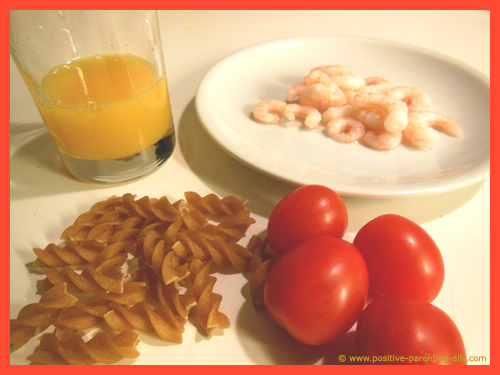 All you need is whole grain pasta, shrimps, orange juice, and tomatoes. Start with cooking you pasta. 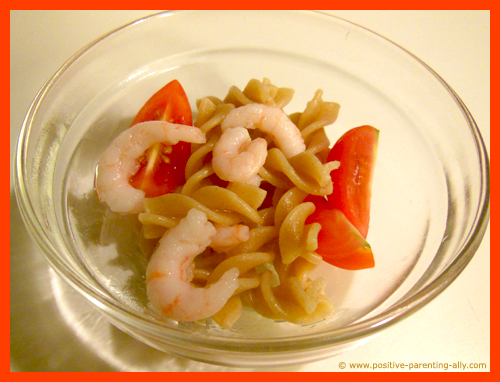 Add it to the precooked pasta. Let it cool off a bit and serve. 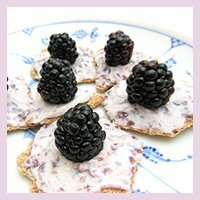 Not only does this healthy snack make an excellent mid-afternoon snack, it is also high in Omega-3 and whole grain carbohydrates to help lift your kid's afternoon mood. Tip: I usually serve this dish in a cup in order to make it snack size. 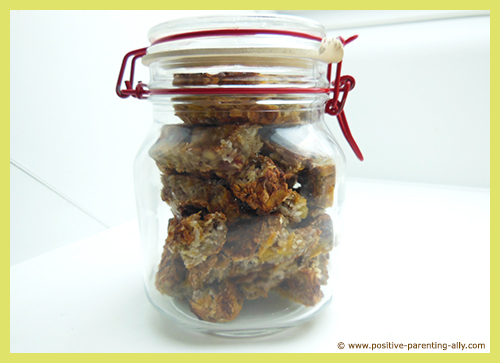 This one of healthy snack recipes for kids is great if your kids need a bit more energy before physical activity. You can also easily use it as a main meal. 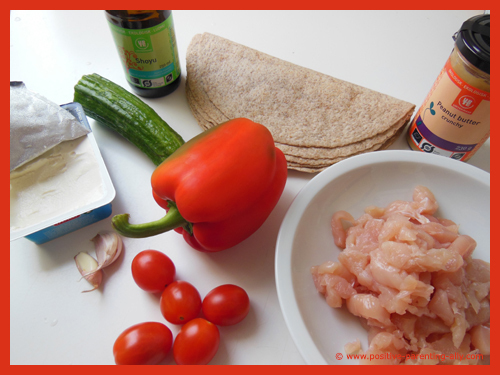 What you need is: chicken, cucumber, bell pepper, tomatoes, whole grain tortilla wrap, olive oil and cream cheese. For a bit of spark you can also use garlic, soy sauce and peanut butter. Fry the chicken in olive oil until it has turned golden. If your kids like a bit of spice, fry the chicken in crushed garlic with a bit of soy sauce and a tea spoon of peanut butter. My son loves this. 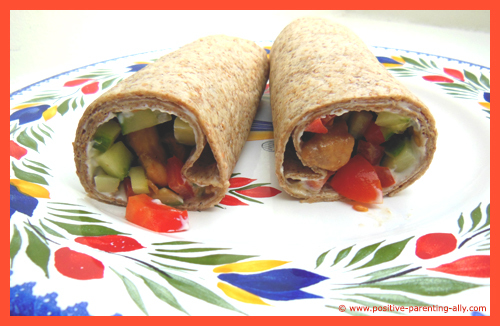 Cut out the vegetables, and simply place chicken pieces, cucumber, bell pepper, and tomatoes into a wholegrain wrap with cream cheese for an easy to make, tasty twist on the average chicken salad sandwich. This tasty snack is a definite bad-mood blaster by containing Omega-3 and vitamin B6 among others. 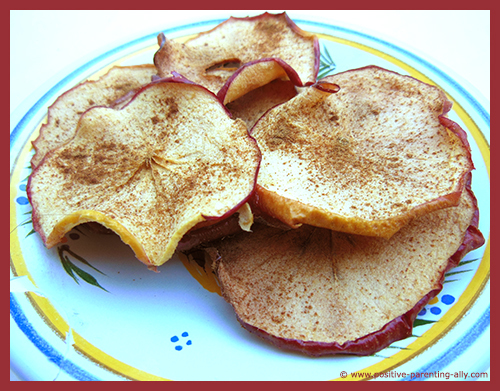 These delicious fruit chips are so easy and quick to make, and all you need are apples and cinnamon. That was simple, right? 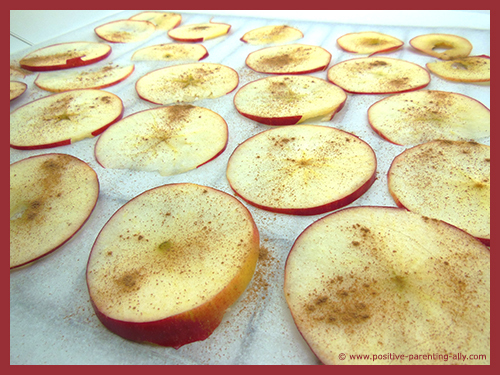 Cut out your apples in very thin slices and place them on a baking tray. Sprinkle them with a bit of cinnamon. Place them in a mid-temperature heated oven and watch them closely. Take them out when they have turned crispy and golden. Let them cool off and serve. These banana mango cakes are so easy to do, because there really is no fixed recipe. You just more or less put in what you feel like in the amounts that suit you. However, you do need the banana to hold it all together. 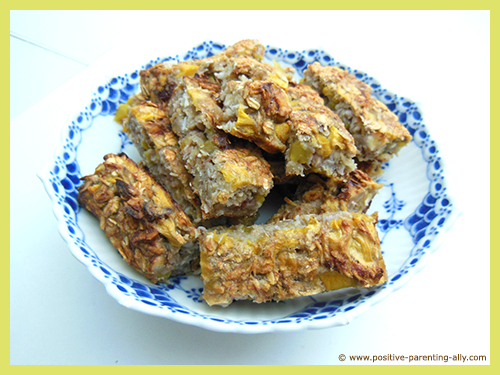 In this version I have used oats, grated coconut, chopped walnuts, dates, mango and mashed banana. Mix all the ingredients together and place the dough on a baking tray in a mid-temperature heated oven. Let it bake until golden, and then take it out and let it cool off. 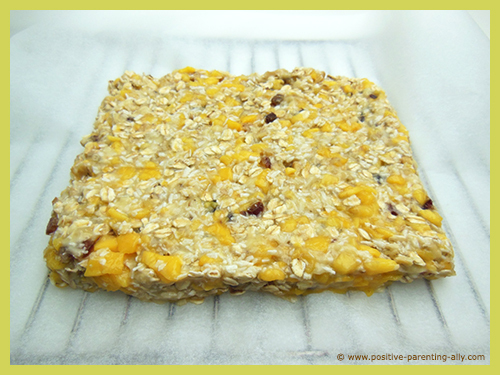 Once cooled off, cut it into snack sizes in small squares or rectangles. Serve, and store the rest. I keep them in a glass jar on the kitchen table, as I don't mind my son snacking on these more than healthy kids snacks. For a lengthy period of time these funky asparagus in a blanket was a weekly treat that I made in the weekends for my son. He more or less expected them. 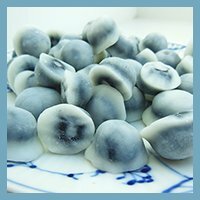 Not only are they incredibly tasty, they are also very handy and fun to eat. 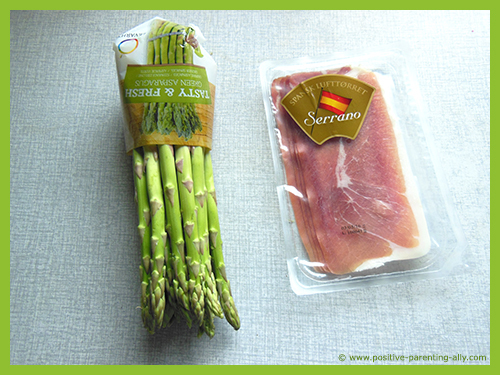 All you need is asparagus and Serrano ham. 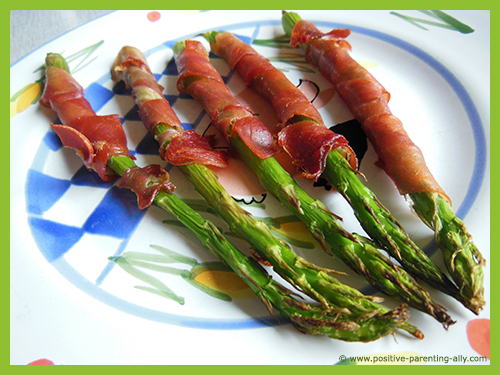 Cut the ham in half length-wise, and roll one ham 'ribboon' around one end of one asparagus. Continue until you have used all of the ham and asparagus. Put the asparagus on a baking tray in a mid-heated oven. Take them out when the ham has turned crispy and the asparagus look nicely cooked. 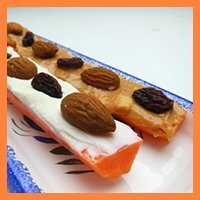 This example of healthy snack recipes for kids contains a good amount of folic acid and vitamin B-12. Because these nutrients work to boost your child's energy, as well as their mood, it makes for an excellent mid-morning snack. 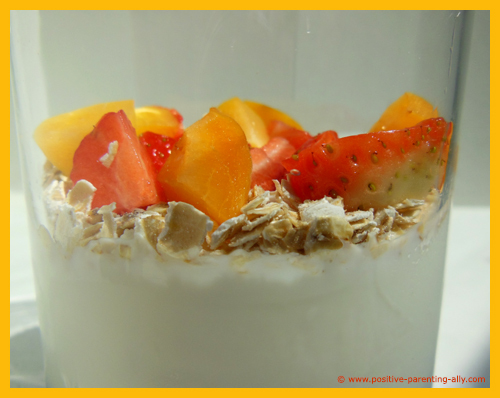 Simply mix one carton of plain yogurt with some oatmeal and add some fruit pieces of your choice - Here I have used and strawberries. 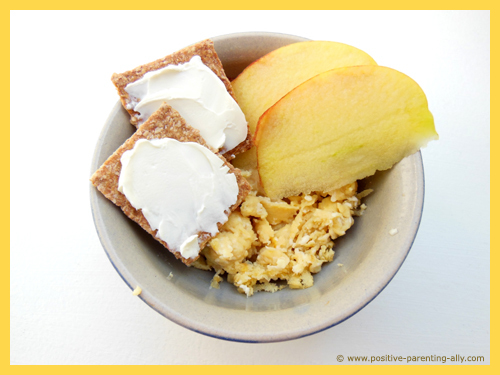 A small portion of scrambled egg topped with thinly slice apple pieces packs a real nutritional punch. Here I also added a little bit of soy sauce to the eggs to give it all a bit of saltiness. Also some non-salty wholegrain crackers with cream cheese. 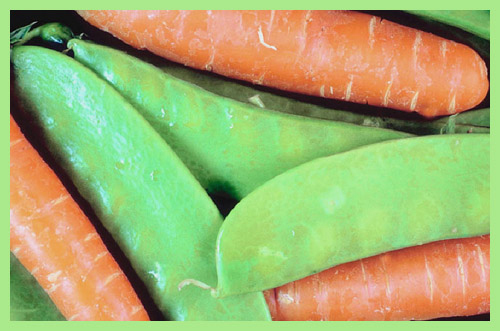 Not only does this easy dish contain Vitamins C and A, it also contains various antioxidants and fiber, all of which help aid your child's digestive system. This rainbow is do easy to do and a lot of fun to eat. 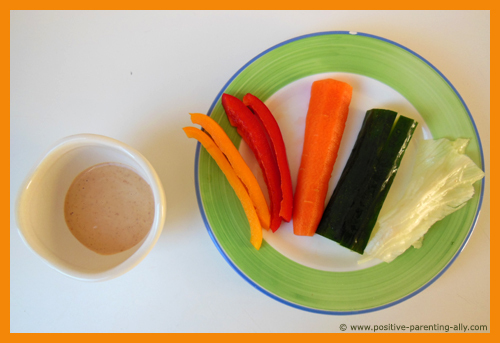 Simply create a rainbow using various pieces of raw vegetables. Here I used orange and red bell pepper, carrot, cucumber and salad. 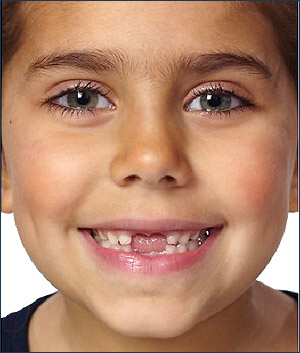 Most kids also love something to dip their snacks in. So simply dilute some peanut butter (getting some healthy protein with all those vegetables) with water or milk so you get a nice dip consistency. 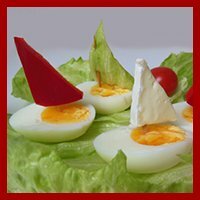 Not only is this dish nice to eat, you can also have fun talking about the colors while your child eats. 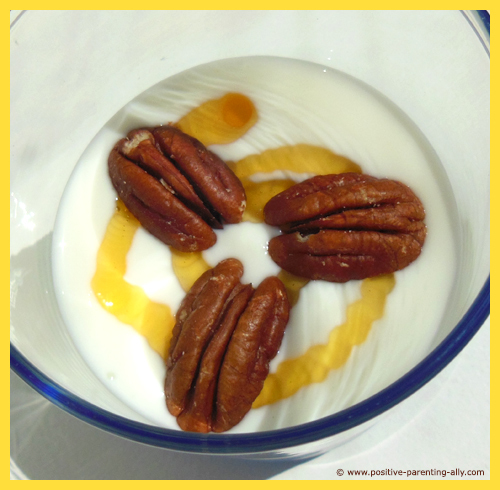 Mix pecan nuts in a pot of yogurt for an energy-boosting snack your kids will love. Add a fun trail of honey for a bit of healthy sweetness. Whoever said the simple things in life are often the best was right. 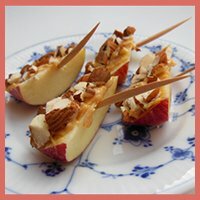 This one of easy healthy snack recipes for kids takes next to no time to create and tastes absolutely heavenly. Fill a sandwich bag with almond and walnuts mixed together with cereal and oatmeal for a quick snack mix recipe your child can eat on the move. If you are worried about your child's weight, then it may be an idea to keep an eye on how many calories they are consuming in a day. 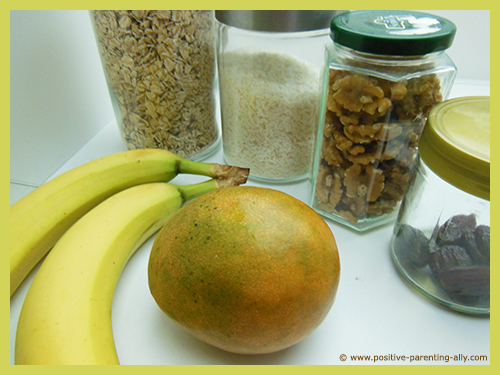 A healthy diet and low calorie snacks for kids should make a difference to your child's weight over time. Yoghurt - The Mayo Clinic recommends reduced sugar or reduced fat yogurts for children who may be struggling with excess weight. Snacking on low calorie yogurt will also ensure that your child gets his recommended daily allowance of dairy. 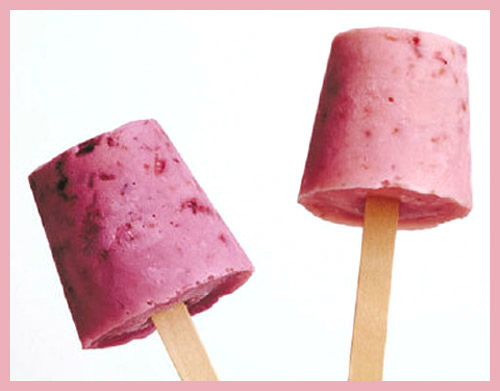 You can easily make them into delicious ice cream by freezing the yoghurt and putting in a stick. Popcorn - All kids like popcorn, right? And because popcorn is made from whole grain, it makes for ideal low calorie snacks for kids. 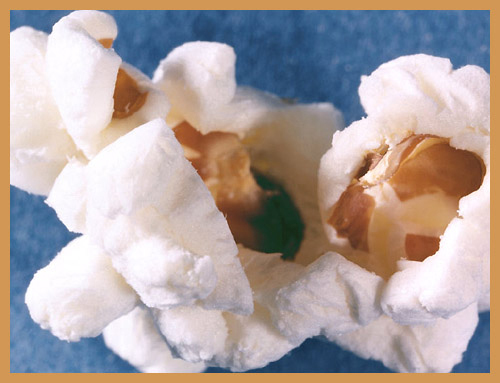 However, avoid popcorn covered in sugar, butter or oil and don't buy flavored popcorn unless you are sure it is low calorie and sugar free. Fruit and Veg - Non-starchy vegetables and most fruits are low in calories. As well as being ideal for low calorie snacks for kids, certain fruit and veg provide important fiber and other nutrients. According to the Food Pyramid, children should aim to have at least two to three cups of veg and one to two cups of fruit a day. 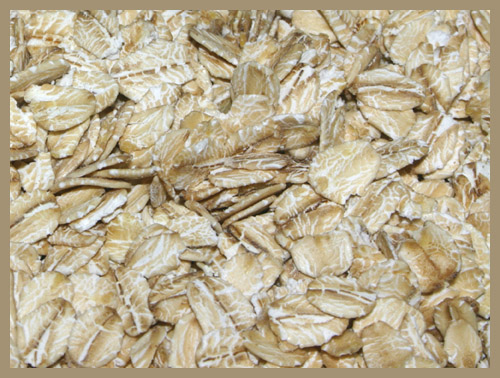 Cereal - Whole wheat flakes and oatmeal are both ideal for quick, tasty snacks that won't endanger your child's calories for the day. Avoid gimmicky breakfast cereals that appear to be designed especially for children, these are often full of food colorings and sugar and therefore are high in calories. This was the end of my healthy snack recipes for kids article. 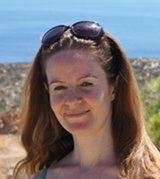 I hope you found some useful inspiration to try out. 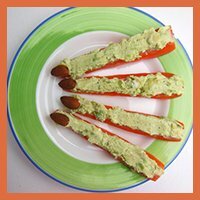 If you're looking for more healthy no sugar snack recipes for kids, please dive into one of my other articles below.